Music for two big things. I thought I had a lot going on, and knew how to dress well to fit my surroundings, but I’m nothing compared to this creature. 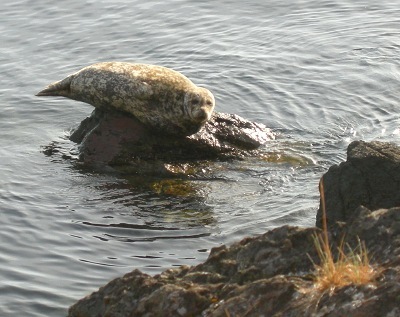 When it comes to balancing acts, I think this harbor seal wins, flippers down. An old cheesy cue, but I still like the music. The view across this archipelago just after dawn, courtesy of my seat on Kenmore Airlines last week. You get a lot for your flying dollars here: not just a lap belt, but a second, full harness belt to sling across your chest should you have any doubts as to how the flight will turn out. I think I may have used it the very first time I flew this route, not wanting to tempt fate. Now, almost 30 flights later, my formerly white knuckles have long since returned to their natural calm pink. Rather than mull over what a sudden water landing might feel like (uh, very cold, in a 52 degree ocean), I mull over the impossible power of glaciers grinding across this area 15,000 years ago, and how the serendipity of gravity created such grace. Still half asleep when I pointed my camera into the little plexiglass window, I was enamored of the softness of the smoky pastel tableau. As always, I had to remind myself why I was leaving for a few days. And as always, I immediately thought ahead to the beauty of this palette, seen later in the afternoon with the plane’s nose pointed north, not south. Going away is filled with the promise of invigoration from the outside world. Coming home is filled with that from within. A happy dance written for the offspring of a friend. Hello again my happy kelphistos, I hope everyone had a great week. I had the option of posting a photo today from that other small island I visit a lot, and showing you really really tall, impressive buildings, lots and lots of bright yellow taxi cabs, and a reasonable amount of neon signage. An accompanying audio file could have included insistent, if ineffective honks, the roar of bus engines as they pull away from the curb, and an array of colorful curse words in languages I never before knew existed and may never have the extreme pleasure of hearing again. 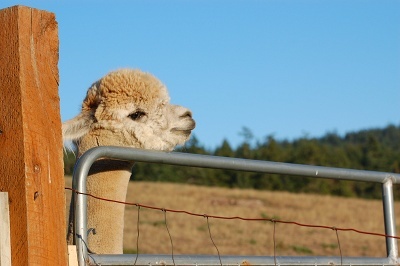 Instead, I’m opting to feature Houdini, who is the top sire of a good sized alpaca herd owned by Krystal Acres up here. When I took yet another of my island visitors to this always-picturesque farm the week before last, set amidst rolling pastures and glistening ponds, I was introduced to this fella and informed that nearly all of the cute babies we saw bouncing around were here thanks to his uh, ardent, efforts. Now, that’s a job description anyone would love. No wonder he’s smiling! Well, I ain’t no Paul Revere, but I do seem to get around the country a fair bit. This morning it’s back to New York City for meetings and, with luck, some Tandoori cooking. I love Indian food, and of the remarkable number of culinary choices here on this island, that’s one country that has yet to be represented. If anyone reading this blog is a restaurateur from that part of the world and happens to be looking to relocate, consider this a big hint. 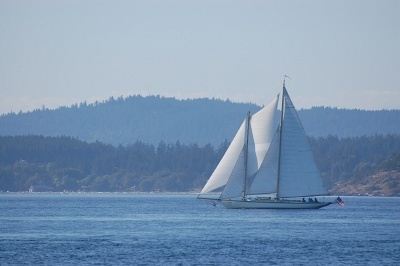 I wish I were taking the gorgeous gaff-rigged schooner above, Adventuress, the long way around: down the scenic Pacific coast, through the locks of the Panama canal, into the Caribbean dodging hurricanes (or not, these days) and up the Atlantic waterways. But instead of course, I’ll be in one of those cute mini-planes featured in earlier posts here, and then transfer to a less-than-cute maxi-plane to JFK. How did I get this photo of Adventuress? 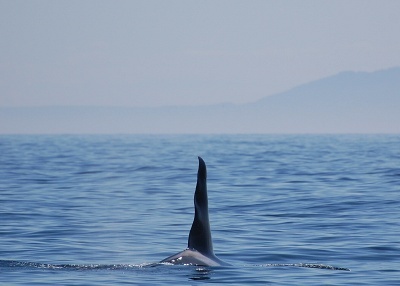 Two days ago I was at sea on a whale watching boat, and we crossed paths on the way back to shore at day’s end. 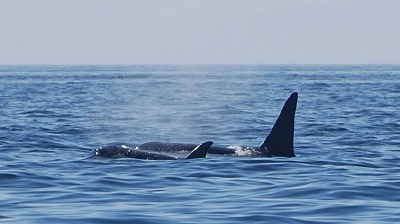 It was a wonderful day in the presence of the Orcas (including a new calf, seen below! ), some Steller sea lions, and my entertaining friend Russell who is a marine docent in the summer months. I’ve been hard at work on a number of new recordings, and taking breaks to venture outdoors and commune with all the wildlife around me has become essential to my sanity. That’s of course making the broad assumption that I had any sanity to begin with. See you all over the weekend when I’m back from my small, native island of Manhattan, to the island about twice as large which I now call home. As you can tell, for very good reason. The longstanding tradition of bloggers posting cute kitty pix on Friday is one which I have shamelessly enjoyed every few weeks or so. But today, I can’t resist featuring another similar-sized creature who shares some of the same personality traits as my clever feline duo here at home. Yes, this fellow comes when I call him. For that matter, I suspect he comes when anyone calls him. 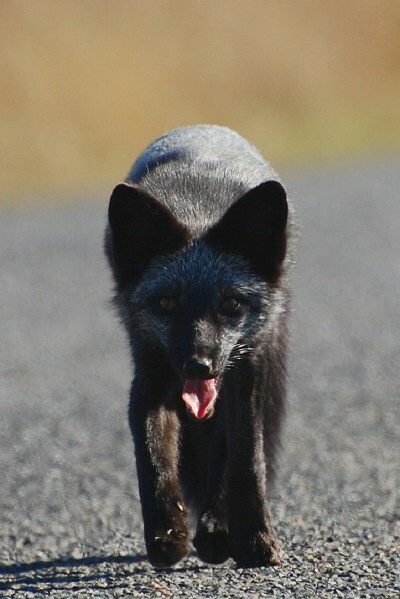 These island foxes have little fear of people, and especially on the heels of a tourist-filled summer, they know that our palms often contain some sort of unidentifiable food product that tastes pretty good, and doesn’t require the effort to chase and kill. I don’t feed these fellas, but he didn’t know that, and when I got out of the car by my favorite beach yesterday afternoon, he trotted right over to me. I’m sure he was disappointed that all I held was a Nikon. I’m the one who got the treat. 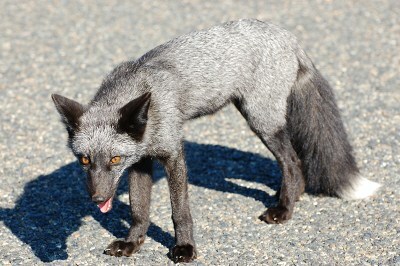 The foxes here come in three basic colors: golden, red, and silvery black (both these pix are the same animal; the sunlight and shadow were variable). They’re all the same species, just different hairdos. I seriously doubt that over eons of time the black ones were evolved in order to camouflage perfectly with asphalt, and yet that’s the result here. Excellent if you don’t want the bald eagles to see you. Not so excellent if you’d prefer that any cars DO. Amazingly, I have yet to see any flattened, furry-tailed splotches, but I imagine it happens from time to time; foxes are all over this isle. I do my best when driving to make sure they’re not all over the road, too. Music for flute and baaaaasoon. So, sheep are not quite as dumb as their reputation might suggest. 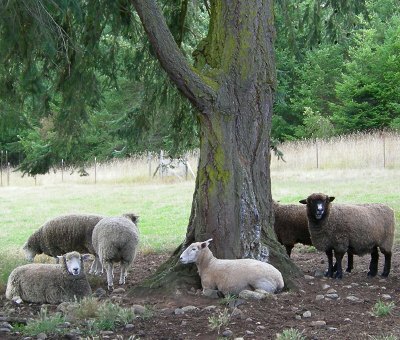 They DO know to stay under a tree in the shade on a hot sunny day. And, to go there for some protection when it rains. After all, they might shrink. Certain color combinations carry with them specific associations emblazoned from an event or a moment from the past. For me, the most powerful and happy duet are purple and green. That’s got to be one of the many reasons I always feel so peaceful when I’m strolling in the local lavender fields. 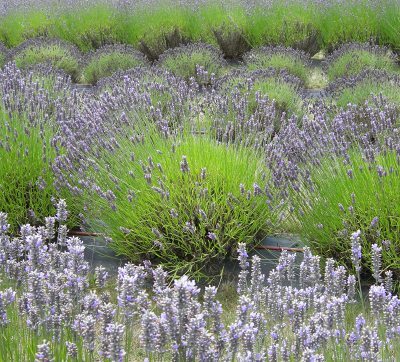 Another is that the scent of lavender is purported to be naturally calming. I think if I became any more calm in my daily life however, my friends might be alarmed enough to check for a pulse. It started sometime around 1980. I lived in Manhattan, and back in the days when you could get across the country and back for $99, I visited a friend in San Francisco. She was a few years older than I, and lived in what was, on reflection, an unremarkable apartment in the Sunset area. At the time however, coated from the grittiness of New York City, I was convinced that I had landed in some sort of urban nirvana, enveloped by a strange new hipness shrouded in fog and incense and carrot cake and a rolling ocean slamming against one side of the town and a million other things that were utterly different from the mundane familiarity of the east coast. Most striking to me was that my friend would set her table with forks, knives and spoons sporting alternately purple and green plastic handles. Why I thought this daring at the time I’ll never know, but there you have it. It was different and it was beautiful and it was beautiful because it seemed exotic and it seemed exotic because so much of the west coast seemed that way to this NYC kid. My friend, and her foggy apartment with the colored flatware, represented freedom to me, and offered a tantalizing view to what my budding life might become. Adding to the color theme mystique, she even had a set of Taylor and Ng coffee mugs that matched, painted with a pastoral scene of rolling purple and green hilltops. Soon after I returned to Manhattan after that trip, I found the same mug and bought it. This morning, 28 years later, I drank my coffee from it, as I have so many times before. And later this afternoon I took a visiting friend to the lavender farm in the middle of San Juan Island. My life, from east to west, from purple to green, and with an ever growing sense of freedom, had come full circle.